Mostly we’re told that salt is bad for us. Healthcare professionals as well as adverts on the TV and radio are forever telling us to cut back and citing risks like heart disease and stroke. There’s no way to get away from it! However, now there is evidence emerging that a salty diet might help to reduce migraines. The evidence comes from data sourced from the National Health and Nutritional Examination Survey, which is a US survey completed by tens of thousands of Americans. Among other things the survey asks is what people ate and drank during a 24-hour time frame, and whether they had a headache or migraine within this time. 8819 adults were surveyed between 1999 and 2004, and the researchers from Huntington Medical Research Institutes in Pasadena, California found that those who had the most salt in their diets from sources such as meat, cheese and bread (and table salt of course) reported fewer headaches. This was rather a surprise for the researchers. Not least because during a migraine, levels of sodium have been seen to rise in cerebrospinal fluid – a liquid within the brain and central nervous system. Sodium ions typically make neurons more excitable so high levels of dietary sodium would at first glance seem like something that would make migraines worse. However, Svetlana Blitshteyn of Buffalo School of Medicine and Biomedical Sciences in New York, who has many patients who suffer from migraines, agrees with the new evidence. She has seen that if her patients start eating more salt as part of a treatment for other conditions they have, their migraine symptoms also often improve. 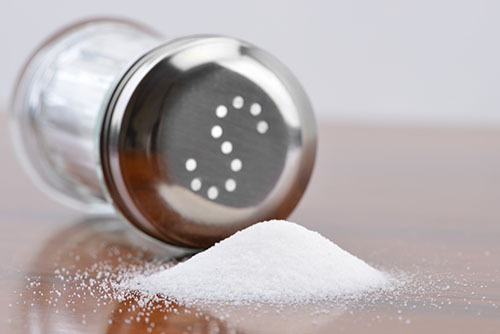 Having said all of this, the researchers behind the new salt discovery have warned that more research is needed before lots of people change their diets given that high salt consumption is linked to many serious health issues. This was posted in Migraine treatment and tagged migraine, salt. Bookmark the permalink.